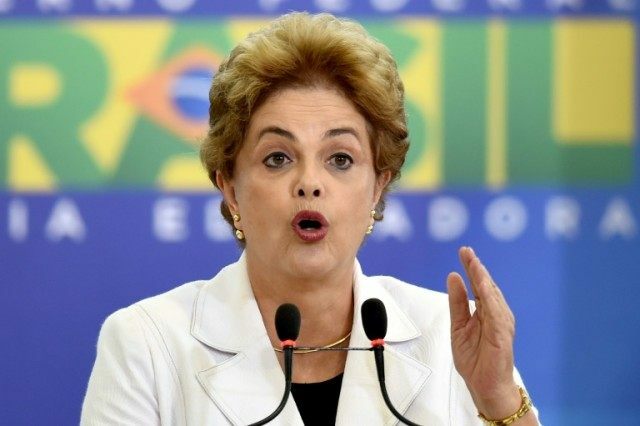 Brasília (AFP) – Brazilian lawmakers launched an impeachment debate Friday that could topple President Dilma Rousseff, in a political crisis threatening to destabilize the country months before it hosts the Olympics. Police tightly guarded the area as lawmakers arrived at Congress, which was surrounded with metal barriers in case of disturbances. House Speaker Eduardo Cunha predicted an intense debate. “It’s calm but I don’t think it will continue that way until Sunday,” he told reporters. Cunha is one of the leaders of the push to remove Rousseff despite facing corruption charges himself. Late Thursday, the Supreme Court rejected her last-minute bid to have the impeachment proceedings suspended. If the lower house votes to push on with impeachment, as seems increasingly likely, Rousseff will be sent to trial in the Senate in a process expected to last months. Rousseff is accused of illegal government accounting tricks. The accusations, along with Brazil’s deep recession, have dragged down her popularity. Latest counts of voting intentions in the lower house by Brazilian newspapers show the pro-impeachment camp at or near the two-thirds majority of votes needed to pass the impeachment motion up to the Senate. She appealed to the Supreme Court alleging that the case against her was a vendetta marred by irregularities. But in an emergency late-night session, justices turned down the petition for an injunction. But the collapse of her coalition has been relentless, starting with the defection of Temer’s PMDB. If the Senate then voted by a two thirds majority to impeach her, she would be ousted and Temer would remain in the presidency. Rousseff’s supporters have vowed to demonstrate in Brasilia each day from Friday. Pro- and anti-Rousseff rallies are also planned in other cities on Sunday. Lawmakers were facing fierce lobbying ahead of the vote, including from Rousseff’s top ally and predecessor as president, Luiz Inacio Lula da Silva. But he, too, faces pressure: the courts have suspended his appointment as Rousseff’s chief of staff over a corruption case against him, linked to a graft scandal at state oil company Petrobras. Lula rallied support for Rousseff in a video message on Friday. Solicitor general Jose Eduardo Cardozo said the government was considering further judicial appeals. “You cannot remove a president of the republic based on some pretext,” he told a news conference.